The NYJTL Mayor’s Cup event will be held from May 29 to June 8, 2019 and will afford NYJTL youth the opportunity to participate at all levels of competition. For more information and to apply CLICK HERE. For more information about participating in the Mayors Cup, contact Pam Glick at mayorscup@nyjtl.org. The NYJTL Mayor’s Cup Girls’ Varsity Team Tournament — Held on November 7 and 10, 2018 at the Cary Leeds Center for Tennis & Learning, the Girls Varsity Team Tournament is a continuation of the Mayor’s Cup All-Scholastic Tennis Championships. 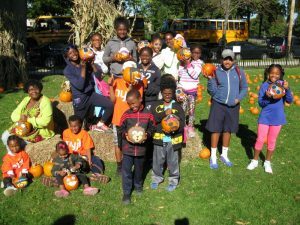 The event offers the fall season’s girls tennis teams from public, private, and parochial schools the chance to battle it out to be crowned the best team in New York City. 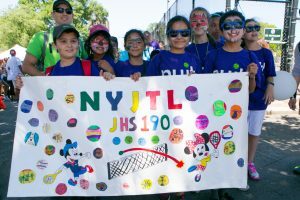 Disney Kids’ Day Parade –– One of the most creative highlights for the NYJTL summer program participants is designing banners incorporating Disney characters. The beautiful works of art are carried by the enthusiastic young artist/athletes in the annual parade. 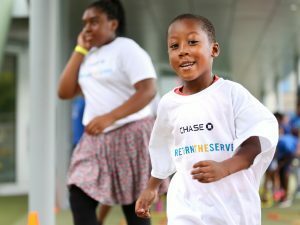 Chase – Return the Serve — Is an annual event held at the Cary Leeds Center for Tennis & Learning in partnership with the USTA Foundation and Chase. 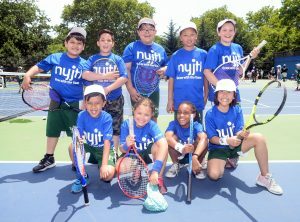 Over 150 children from NYJTL programs are invited out the Center in July for a day of exercise, tennis, zumba, arts & crafts, healthy living, and more. 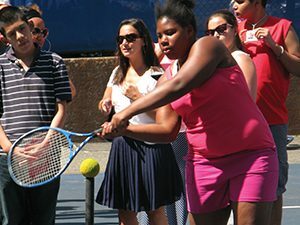 Through the USTA Foundation, Chase provides a grant to facilitate additional free NYJTL youth programming throughout the year. FACES — The Family and Community Engagement Series (FACES) is a free tennis and education pilot program at the Cary Leeds Center that commenced in January, 2016. 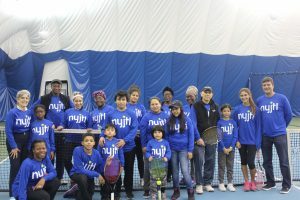 The program welcomes families from the South Bronx community to participate in tennis and other programs, which include healthy living, financial literacy and more.